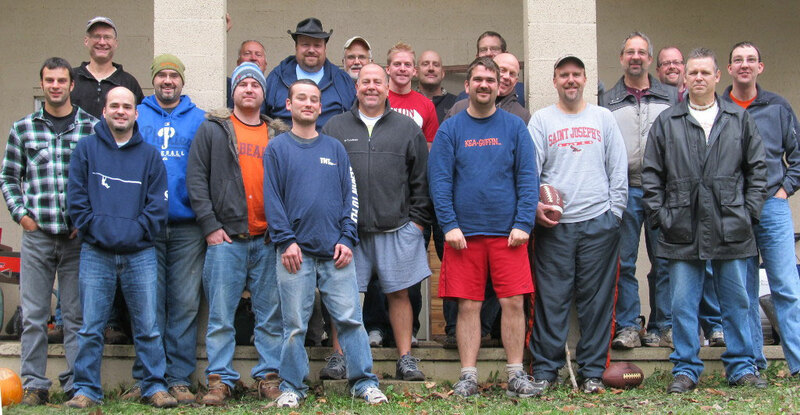 21 guys rendezvoused to the mountains of North Central PA on November 1-3 for a time of spiritual renewal, fellowship, fun, and relaxation. Phil Tyson hosted this large group at his cabin for the 11th straight year. He cooked up some fabulous feasts - no one went hungry! This year Pastor Kenton Martin from Palo Alto Mennonite Church in Pottsville was our guest speaker and challenged us from John 20-21. Other highlights included chopping up a large pine tree stump, the epic campfire, playing football in the rain, hiking, board/card games, & target shooting. It's a great way to get to know other guys!